Some weeks ago, i had the opportunity to listen to a fantastic speech by Joshua Cooper Ramo, writer of the book “The Age of the Unthinkable: why the new world disorder constantly surprises us and what we can do about it”. This is the sort of guy that when he takes the stage, you immediately know you’re in for something special. Our world offers more options. We have a spectrum choice between no options –> limited options –> unlimited options. You can’t predict what people are going to do with these unlimited options. So far the analysis. How can we manage this unpredictability ? One eye-opener was a visual showing how differently western and eastern people look at a picture: western people mainly look at the object, eastern people mainly at the surrounding environment of that object. So, understanding of unpredictability has a lot to do with understanding the environment. It will also require resilience. But not resilience as we know it from messaging networks like SWIFT. More a resilience deeply integrated in the ecosystem, a bit like Hezbollah integrates resilience in every little piece of its organization. Periods of change are not the exception but the rule. look at how the wave can help you. It will be ever easier to disrupt. The question is how to empower people to disrupt for the good. This is really about innovation driven by a set of values. Oh boy, how close is all this to the ideas of our Think Tank on Long Term Future. Innovation in big companies can NOT take the lead. They have NOT been instrumental in the shifts from magazines to online, from Microsoft desktops to web2.0 cloud, from Financial Institutions to… un-banked payment and financial solutions. The speech was delivered as part of an Oracle conference. So, i found it a bit “cheap” to say that Oracle was innovative and Microsoft not. The rationale being that Oracle “buys and integrates” and Microsoft buys “tons” of innovation but does nothing with it, does not integrate. Was a bit too close to the Oracle conference message of acquire and integrate. He then went further on the theme of personal responsibility (i am free to smoke) and the balance with a certain set of basic rights (for ex healthcare). And that in the USA, everything is about rights (and maintaining that state) not about personal responsibility and that that has to change. About maintaining states: Twitter is all about maintaining state in a constant changing environment. during disruptive change. And that in these circumstances simple answers are usually dangerous answers. Or the closing topic: never invest in people older than 25 years, as they are not used to live in constant change. The speech was great. The book reads “like a train”. After all these weeks of technology extravaganza, time for some relaxation with a piece of music: “Doorways” by Dan Bull. The Singularity Summit is coming on 3-4 Oct 2009 in NYC. See the impressive list of speakers here. 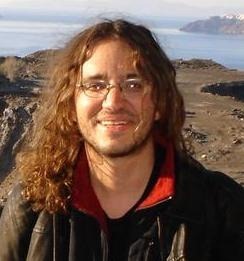 One of the speakers is Ben Goertzel, who will speak about “Pathways to Beneficial Artificial General Intelligence: Virtual Pets, Robot Children, Artificial Bioscientists, and Beyond”. When talking about Robot Children, i would not be surprised if he used the following video made by his 12 year old daughter. Found it via Accelerating Future. Is this what a 12 year old is thinking about ? Grand Pa’s dying, and let’s upload his brain onto the computer ? It’s uploaded on a Windows computer… do kids care ? Is Grand Pa dead together with all the files on my computer ? A universe with Windows does not deserve to exist ? 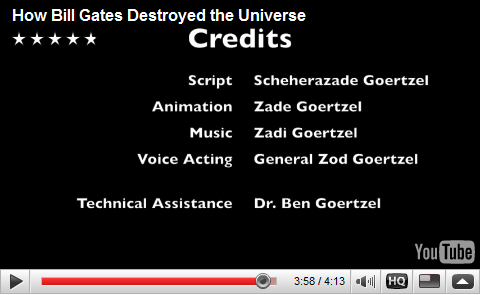 If you can believe the credits at the end of the video, at least 12-year old Scheherazade Goertzel does. In this case – among many other things – Scheherazada’s father is the originator of the OpenCog open-source AGI framework, as well as the proprietary Novamente Cognition Engine AGI system. You see what happens when kids get this sort of ideas served with the mothermilk 😉 We recently presented another mothermilk example when we spoke about Aza Raskin, now Head of User Experience at Mozillla Labs. His father was Jeff Rasking, one of the big minds behind the Apple user interface. Very curious to see what how this Generation-M will move up the ladders, and one day be our leaders. Any other wizkids you are aware of ? Also all hyped up by “The Wisdom of Crowds” and “We are smarter than Me” ? Two articles about some recent studies done on this subject. 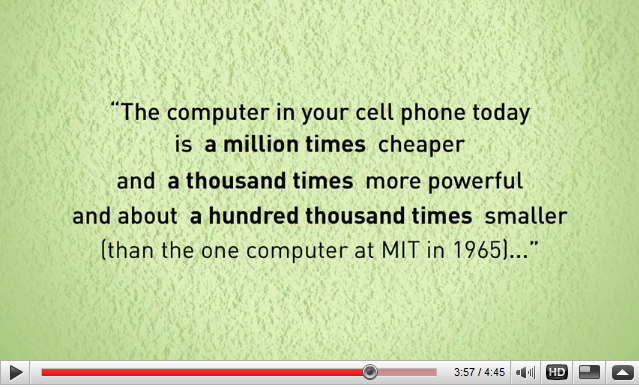 One from ReadWriteWeb and one from MIT Technology Review. It’s again from Carnegie Mellon University (CMU). The author professor Vassilis Kostakos pokes a big hole in the prevailing wisdom that the "wisdom of crowds" is a trustworthy force on today’s web. The articles speak for themselves, but what’s also interesting are the comments on the MIT article. I think that crowds are not wise and what we call Wisdom of Crowds is nothing else and not more than the Power of Diversity. This paper shows that it can be the Weakness of Diversity too. The true critic is NOT motivated by money or the subjective personal biases of the non-critic. A true critic is motivated by the objective enhancement of the human experience through careful and educated examination of the subject at hand. We need more well-honed critical voices and less of the braying of the crowd. Crowd wisdom is built on a logical fallacy: just because a lot of people say it is so, doesn’t make it so. As organizations roll out social technologies, they might want to start with the volume knob set "low" for certain classes of users. For example, some users might be allowed to tag one type of content, or other certain users can blog or comment. Controversy ? Sure. What do you think ? Still 100% convinced of the Wisdom of Crowds ? Over the last month there was an interesting series of articles on Read Write Web about the Top-5 trends on the web. They now come all together here. There is also a presentation on slideshare and you can download the whole thing also in PowerPoint. The sections on Real-Time web and Internet of things are a bit poor. I would definitely add a 6th trend: reputation and clout. Also semantic web could have some more meat around the bones. Not much left, huh ? Coincidently, i found another one on slideshare addressing that same topic. It takes Boris about 30 slides to get up to speed, but he is bringing some interesting concepts such as “Robot Food”, Open Source licensing of data (our lawyers will go bananas), economic incentive to influence search, and community building. View more presentations from Boris Mann. However, i am not convinced by this deck either. Is there any better material around that would allow me to explain in layman’s terms why this is so important (you preach to the convinced). In my opinion, there is a great role for standards organizations such a SWIFT to leverage and redefine their role as semantic ontology sources for vertical segments such as the financial industry. They must be able to leverage their standardization expertise into other domains than just standard “messages”. Now they could take the lead in standardizing ALL data: structured and non-structured. That would allow us to create powerful mash-up driven solutions that get us into intelligent pattern recognitions engines for the industry. Now that Innotribe @ Sibos is over, back to the real purpose of this blog: “Inspire others to dream”. For a recap, see the very first post of this blog, back in April 2009. There is something fascinating and very profound that is going on with on-line reputation. This post is about values in the on-line world. It is very much related to the upcoming Think Tank on Long Term Future, where we want to deeply thing about the value kit needed in a transhumanistic and singularity type of world. It also relates to our on-line identity and its evolution, a theme that i often have addresses on this blog. First, The Whuffie Bank. 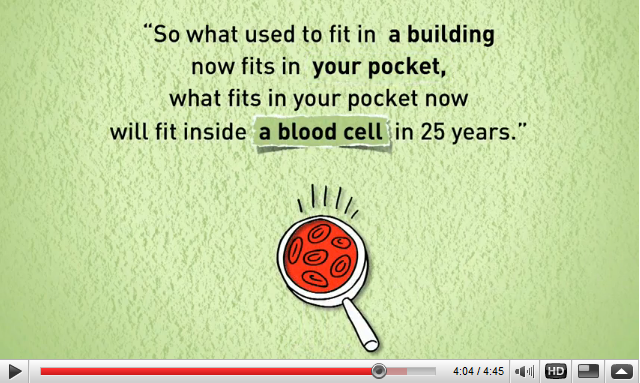 Nothing better than watching yourself the TC50 Video and comments here. Also the second part of the video is interesting: the debate and feedback session: the most important comments was that reputation is contextual. I maybe interested in the ideas of a couple of on-line friends only. My own tribe so to speak. But even in my own tribe, i may appreciate the techie knowledge of Nick for example, but not at all be interested in his political ideas or preferences. Or have a look at The Whuffie Bank website. The Whuffie Bank from The Whuffie Bank on Vimeo. The Whuffie Bank is a nonprofit organization dedicated to building a new currency based on reputation that could be redeemed for real and virtual products and services. The higher your reputation, the wealthier you are. It’s in the same spirit of Creative Commons, an organization that’s changing the contract between our ideas and us; we want to build an open organization that aims to measure and enable the exchange of online reputation. 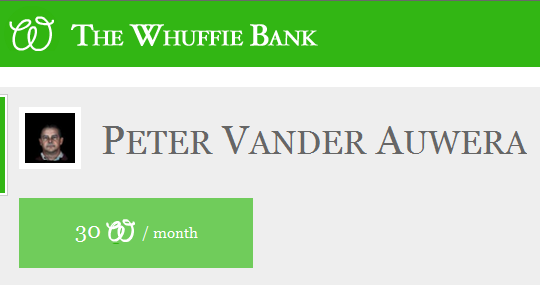 The Whuffie bank also has some crazy ideas on how they could you beyond the web into the brick & mortar world, by for ex printing money or having credit cards with whuffies on it. 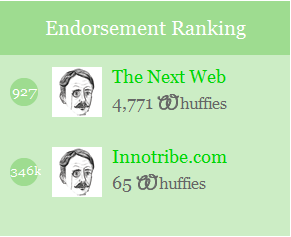 More interesting is to see where my “Whuffies” come from, and what triggers reputation changes and endorsement ranking. It’s all in the same spirit Creative Commons, where fundamental re-thinking was done on the relationship we have with ideas and the copyright contract. Now we are re-thinking the relationship we have between our values and the money contract. The message content is analyzed. If a tweet has a link, the link is more important than the couple of words before it. Second, one of Seth Godin’s latest posts. Seth is the author of “Tribes” and the name Innotribe was based on the title of his book. The web knows something, but it’s not telling us, at least not yet. So, what if, Google-style, someone took all this data and figured out who has clout. Which of your readers is the one capable of making an idea break through the noise and spread? Bloggers don’t have impact because they have a lot of readers, they have a lot of impact because of who their readers are (my readers, of course, are the most sophisticated and cloutful on the entire web). Thirdly, at last week’s Innotribe @ Sibos, the crowdsourcing team pitched the idea of “Trust-Score”. What a pity this one did not get a better pitch Because it’s also really about trust-reputation. But then in the real-world of money. And how one could spot patterns in somebody’s online money behavior and how deviations from the measured average could lead to fraud detection algorithms and alike. Or, fourth, what would happen if we mix all the above with my colleague Matteo Rizzi’s “Mindtagger”. At this stage “just” a searchable repository of people as mind-skills, but what if we throw reputation on top of it ? And Whuffies, based on how much good somebody does for the community. And Clout to see who is helping spread our ideas ? why wait till next year ? Who is interested ? Please comment to this posting. We’ll feed it into the Think Tank for the value bit and into Innotribe for the project bit.